Our Customers are our focus! - ACG offers not only on time, friendly and competitive service and pricing. We work with the customer to ensure satisfaction and establish long term relationships. Always acting in the best interests of our customers. We have what you need! - Our business model of purchasing in large quantities and expert re-manufacturing team gives us access to an abundance of parts, resulting in your getting the “right” part at the “right” time. Direct access for customers! 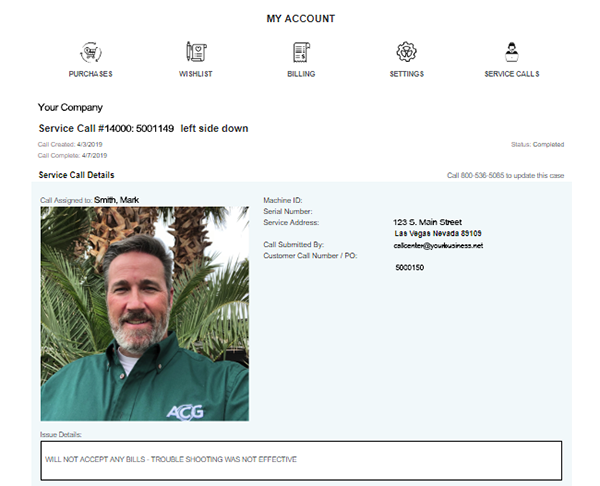 - The customer engagement “Portal” gives direct access to enter a service call, “track” the call and view updates. View which CSE is assigned to your call, when work begins, and when work is completed. The portal also allows for detailed purchase history, accounts receivable, and outstanding service calls, on-line purchase capability, and other options. Our uniformed professional technicians carry ID badges and an iPad with cellular communications for improved access to knowledge databases. Our vans have GPS tracking, ensuring efficient dispatching to your site. ACG announces arrival to branch personnel! - Three cheers for common sense! Our CSE’s always let branch personnel know they are about to work on their ATM and branch equipment. ACG's Main Facilities are located near the Atlanta transportation hub, with 3 locations totaling over 130,000 square feet. Choose ACG – THE CONFIDENT CHOICE! © 2018 Atlanta Computer Group Inc. - All Rights Reserved.